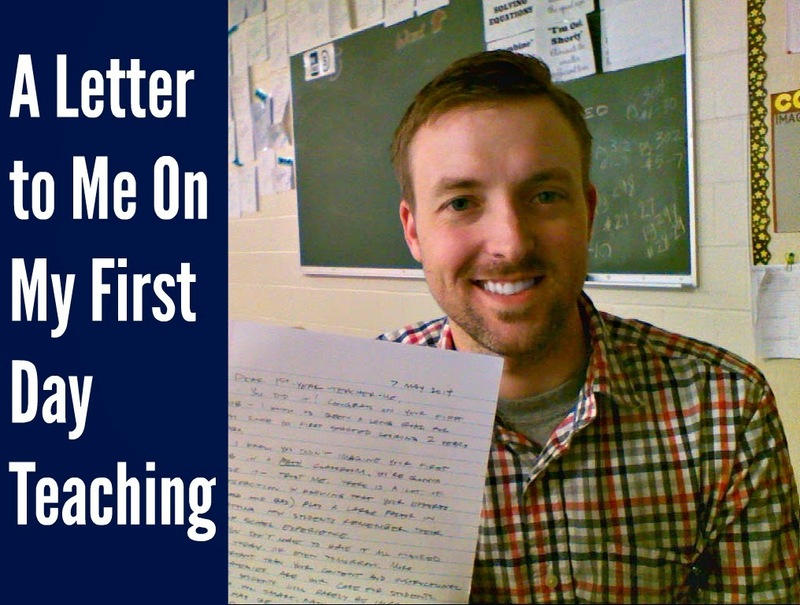 I've written a post about your first year teaching before, but "letter to me on my first day of teaching" seems different, so I did that this afternoon during my prep. You did it! Congrats on your first job - I know its been a long road for you since you first started applying to social studies jobs 2 years ago. I know you didn't imagine your first job in a math classroom, but you're gonna love it - trust me. There is a lot of satisfaction in knowing that your efforts (good and bad) play a large factor in crafting how your students remember their high school experience. You don't have to have it all figured out today. Or even tomorrow. More important than your content and instructional strategies is your care for students. Your students will rarely be impressed with how smart, rational, or quick-witted you may be. They will remember and respond to how you treat them, how you respond to them, and how quick or slow you are to quit on them. They won't respect you for your degree, your content knowledge, or even your skills with technology - they may even resent you for it. The best relationships you have with students will always be driven by how well you show your care. I know you've got two lessons to prep for tomorrow, so let me finish with a few tips to carry with you. 1. Be quick to listen and slow to speak.Students sometimes just need to be heard, and our colleagues are always good for a fresh perspective to a problem you may have. The only teachers or student-teachers I've seen completely flounder or burnout are the ones without the humility and wisdom to know you never have it all figured out. 2. Show your care first, then your students (might) care about what you have to say.I've see a few, but its been rare that I've bonded with students with the math. What I've seen much more often has been students who will persevere because we've bonded over something else. If the learning spark never ignites, however, don't beat yourself up. Ultimately, its up to the kid. 3. You can't be friends with your students, but you can love them (and you'll understand that more the older you get).They're still kind of close to your age right now, but by the time you're in your early 30s, they'll have more in common with your own children than they do you. Just as you would with your own, never tire of second chances, and be careful to burn any bridges you'll have to repair tomorrow. The best you can do as their "friend" is to be "cool" - a passing achievement indeed, but if you love them enough to let them hurt you, or even disappoint, then you can win them. Good luck, Chuck. Whenever you have tough days (and they will come), always remember that your heavenly Father knows and gives you everything you need, and He will come through at school as well.